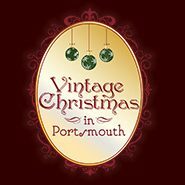 Save the Date for Vintage Christmas in Portsmouth. Celebrating the winter, the warmth, the light, and our collective memories of holidays past. Created by The Music Hall in a partnership with Strawbery Banke Museum, this month-long city-wide event will once again offer the magic of Broadway as The Music Hall partners with the Ogunquit Playhouse to bring the Irving Berlin’s classic White Christmas to their historic stage and returning for it’s 36 year, the irresistible Candlelight Stroll at the Strawbery Banke Museum.